Where Is the Philanthropy of Muslim Millionaires? Moved by the miserable plight of Afghan girls, Hollywood superstar Angelina Jolie has set up a school at a cost of $75,000 to accommodate as many as 800 students. The question is, where are the Muslim millionaires and billionaires and what have they done to alleviate the plight of the Afghans who have suffered immensely in a more than 30-year war imposed on them first by the collapsed Soviet Union and now by the United States and Europe? Afghan Muslims have been subjected for more than three decades to one of the worst forms of killings and atrocities ever known in human history. Despite its ancient and rich history it is today a bankrupt wasteland. What have the Muslims—from Indonesia all the way across Europe—done to save this country and protect its people? The vulgar opulence of the ruling elite of some rich Muslim countries, stretching from the Gulf to Brunei, is common knowledge. Their palaces of extreme luxury built with the natural wealth of their countries from which their people should have benefited, private planes that are more like flying palaces, gold-plated toilets, vulgarly decadent lifestyles, and, on top of all, willingness to collaborate with the crusaders against their own Muslim brothers and sisters show the low moral depths to which they have descended. Millionaires and billionaires all over the Muslim world float in extreme wealth and spend lavishly on enjoyment. And not just enjoyment; what they do amounts to wanton wastage. I know of cases in the Gulf countries where seven camels would be slaughtered for a feast, and the invitees would partake of a small piece from one or other of these where one or two camels would have sufficed. The rest is dumped into garbage trucks and disposed of without any qualms whatsoever. How many of them have ever stopped to consider the plight of oppressed or poverty-stricken Muslim people? How many of them have ever thought of providing a decent meal or a piece of cloth, leave alone building a school, hospital or even a hut to shelter a fellow Muslim? Can they call themselves Muslims by any yardstick? Angelina Jolie started visiting refugee camps around the world after filming "Tomb Raider" in Cambodia. She insisted on covering all costs related to her missions and shared the same rudimentary working and living conditions as UNHCR field staff. This humanitarian work earned her the name as a good will ambassador by the United Nations in 2001. 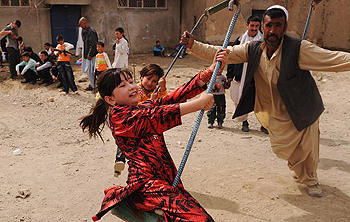 In October 2008, one of these visits took her to refugee settlements in Afghanistan's eastern Nangarhar province, where she was moved by stories of the suffering Afghan people and the plight of families who were reluctant to send their girls to mixed schools for religious or cultural reasons. She decided to set up a girl's school, which, with eight classrooms and four administration buildings, was opened on March 15. Jolie attended the opening ceremony. Speaking at the ceremony, 14-year-old Laila, whose family returned to Afghanistan from neighboring Pakistan in 2008, praised Jolie and the United Nations for investing money in education. She said, "I always had hopes and dreams of going to school. The hope to become a qualified teacher has revived me." Her father Ustad added, "This is what we needed here, and I believe there is a need for every community—if we want to build the future of our country—to build schools and get education." Earlier during a visit to Afghan refugees in Pakistan Jolie donated $1 million for Afghan refugees. Where are the rich Muslims to help the poor, the hungry, the war-torn?